Ronnie O'Sullivan, Barry Hawkins, Neil Robertson and Mark Selby have all made it to the World Championship semi-finals, but the job is only half done. There may be only five days left of the 17-day Crucible "marathon of the mind" - the phrase coined by commentator Clive Everton - but with snooker's most prestigious event lasting as long as an Olympic Games, the players are not even into the home straight. The remaining quartet have all won 36 frames so far. They still need another 35, from a potential 68 to be played, to reach the winning line. So how do players cope with the gruelling nature of the tournament, on and off the table, in order to be crowned champion on the first Bank Holiday Monday in May? Three former champions - 1991 winner John Parrott, seven-time champion Stephen Hendry and 1997 victor Ken Doherty - explain. You want to stay focused on the task in hand, but 17 days is a long time to be cooped up in a hotel room on your own. What do you do? Doherty: "I always took my mate; I always wanted some company. He helps by cheering me up when I need it and was someone to talk to about the game when I played shots badly or well. I would always rent an apartment because you created a home atmosphere. You weren't stuck in a stuffy hotel room. You have a little bit more freedom and space to yourself. It is a bit like a home away from home, very chilled out." Parrott: "I would go with my best mate Tony and my manager. If I did any good towards the business end, then my family would come over. The first five years of my marriage my wife came with me everywhere and that was the most successful period in my career. The problem came when I had children and I was away on my own. To have your pal there to let a bit of steam off is important." Hendry: "I would stay in the same hotel every year from when I started at the age of 17 until my last time in 2012. On just one occasion I stayed elsewhere because they were renovating it. I suppose you could call it superstition but that year it didn't feel like the World Championship. I used to go down with my driver and my manager. My dad would come down to watch the matches too." Parrott: "Players are very superstitious. Steve Davis used to walk to the arena the same way. There used to be an ale cellar and he used to walk across it every day." Back in snooker's 1980s hey-day, the sight of Jimmy White sucking on a cigarette or the late Bill Werbeniuk downing pints during matches was a familiar one. Times have changed. Peter Ebdon embarked on a new vegan diet which helped his form, Shaun Murphy changed his eating habits to help improve his stamina and concentration at the table, while Ronnie O'Sullivan is a keen long-distance runner. Parrott: "Looking back, I would have done things differently. I would have been fitter, and watched what I ate, especially now the standard is so high and you need the slightest advantage you can get. I was bone idle. I turned up one year as fit as I could be and I played great. It definitely works. The running Ronnie does has helped with his longevity and he is at the top of his game when most players have finished winning." Doherty: "I have always stayed clear of the fatty foods. If you start putting on weight, you slow yourself down and you get tired very easily. You don't want to be tired at the Crucible. Your concentration lapses and that can cost you a frame and ultimately a match. You need to get plenty of rest, eat as healthily as possible but have a treat every now and again. In 1997, I didn't consume any alcohol at all. I was dry until after the final, when there was plenty of bubbly consumed." Hendry: "I would go out for dinner but not have any late nights out. There was a glass of wine with the meal but no excessive alcohol consumption during the tournament. You are there to do a job." Parrott: "If you finish one evening and play again the following morning, you won't get a good night's sleep because you are hyped up with adrenaline. The ability to sleep is very under-estimated. If you can just nod off for half an hour, it would be fantastic for you. I never could." The tournament's history is littered with examples of players who arrive in the final jaded and mentally exhausted after coming through nerve-shredding, emotionally draining semi-finals, sometimes following an equally taxing quarter-final. The likes of Graeme Dott (2004), Mark Selby (2007) and Ali Carter (2008) all suffered a reaction to their earlier efforts. In the last decade, the famously durable John Higgins is the only player - twice, in 2009 and 2011 - who has prevailed in the final having played in more frames leading up to it than his opponent. O'Sullivan has arrived in each of his five finals the fresher player in terms of table time, and won them all. Sweeping aside opponents, particularly in the semis as O'Sullivan did to Hendry in 2004 and 2008, pays off in the final analysis. Hendry: "People say snooker's not a physical sport, but it's one of the most mentally draining. Your concentration has got to be on it the whole time, even when your opponent is at the table. You've got to be ready to strike. The ideal situation is to win matches with a session to spare and it is in the back of your mind. My aim would be to win each session 6-2. You can win it in the first session if you dominate your opponent. It is a long slog so you need to win the matches as easily as possible." Doherty: "People say, 'how is it exhausting?' but when you have the mental strain, the adrenaline running through your body and the pressure, all that takes its toll on you physically." Parrott: "In 1989 I had a good season but was not expecting to do well because I was mentally tired. But I had a favourable draw, and ended up in the final with Steve Davis. I was a spent force. I was shaking his hand after the first frame. I knew I was in trouble and ended up 12-3 down after the first day and had nothing left to give. It was horrendous. I just had to sit and suffer and lost 18-3. I was mentally gone before I got there." Doherty: "In my spare time, I'll have a look around the shops in Sheffield and then go for a meal or to watch a movie in the evenings. I play a bit of poker which relaxes me. You always want to get away from the Crucible, have a walk around the town centre and get some fresh air. You want to keep your mind off snooker. It is always good to get away for a couple of hours and clear your mind." Parrott: "We always went to an Italian or Chinese restaurant and did talk about snooker but we were all football mad so that would tend to dominate. There might be a film out I want to see so I might go to the cinema. Spending time in between sessions is one of the hardest things you do in a World Championship. You know you are killing time. The year I won it, I beat Tony Knowles in the second round 13-1 with a session to spare and ended up going to Pontefract races with my pal. I had a lovely day out while others were sweating it out at the Crucible." 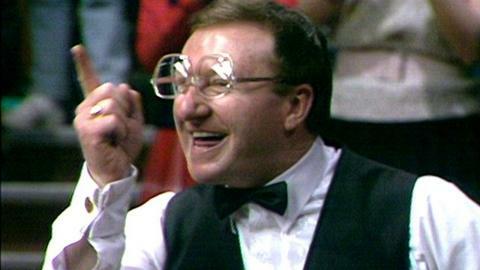 1985 world champion Dennis Taylor: "You have a few friends around you. Ronnie O'Sullivan has [artist] Damien Hirst with him. He is always here when Ronnie is playing. They are good friends and they go off and have a meal together afterwards." Doherty: "The atmosphere inside is very special, like nowhere else for a snooker player. The people are so close to you and it gives you such an adrenaline rush. Your mind does wander when you are there but there is nothing wrong in that. It is when you're at the table that you need to lock yourself in and focus on the job in hand." Parrott: "The only time I felt 100% in control and as good as I could play was the year I won in 1991 against Jimmy White. The only thing I was thinking of was that if he misses, then I will clear up. It sounds incredibly cocky but it was the only thing I could think of for the 17 days." Doherty: "In 1997 I started off slowly but after beating Steve Davis, John Higgins and then Alain Robidoux, I was loving it. For the first time, I felt so relaxed. I was laughing and joking with the crowd. Hendry hadn't been beaten in his previous six finals but I was so excited to be facing him. I saw my name on the trophy and believed I was going to win it. [Doherty won 18-12]. Nothing was going to stop me." Hendry: "It is the World Championship, I was always up for it. It is the best place to play. There is nothing else like it. The atmosphere is so special. I never felt exhausted at any stage. It is just an excuse that is used. If you can't get yourself up for the World, to produce your best at the Crucible when it matters the most, then you are not the player you think you are."